In Promoting Early Career Teacher Resilience the stories of 60 graduate teachers are documented as they grapple with some of the most persistent and protracted personal and professional struggles facing teachers today. Narratives emerge detailing feelings of frustration, disillusionment and even outrage as they struggle with the complexity, intensity and immediacy of life in schools. Other stories also surface to show exhilarating experiences, documenting the wonder, joy and excitement of working with young people for the first time. 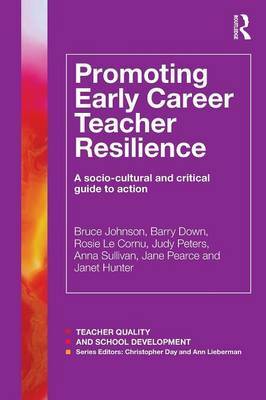 This book makes sense of these experiences in ways that can assist education systems, schools, and faculties of teacher education, as well as early career teachers themselves to develop more powerful forms of critical teacher resilience. Rejecting psychological explanations of teacher resilience, it endorses an alternative socio-cultural and critical approach to understanding teacher resilience. The book crosses physical borders and represents experiences of teachers in similar circumstances across the globe, providing researchers and teachers with real-life examples of resilience promoting policies and practices. This book is not written as an account of the failures of an education system, but rather as a provocation to help generate ideas, policies and practices capable of illuminating the experiences of early career teachers in more critical and socially just ways at an international and national level.